Until 1999 there were few opportunities to network and share evaluation experiences in Africa. Evaluators worked in isolation. They were seldom trained in evaluation approaches, methodologies and standards, and tended to be technical specialists or management consultants recruited to serve as evaluation consultants. Although a few national evaluation networks existed, they were isolated and often unable to mobilise the capacities and resources to facilitate effective networking and sharing of knowledge within and between countries. Evaluation capacity building efforts were sporadic and mostly driven by international development organisations. There were few attempts to nurture advanced level evaluation expertise, to promote training placed in African contexts and evaluation approaches, or to highlight African evaluation expertise on international platforms. Demand for evaluation was low and the use of evaluation for learning and decision-making limited and dominated by accountability to international aid agencies. AfrEA was founded in 1999 to address some of these challenges. It was established as an umbrella association for national evaluation associations and networks, and as a resource for evaluators in countries without such networks. 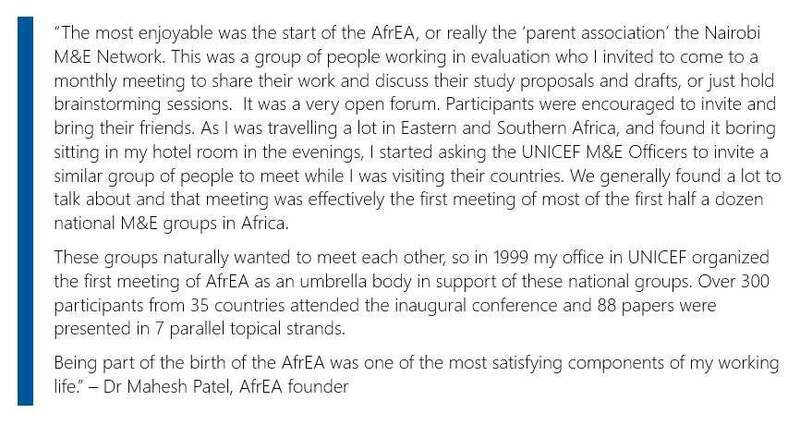 Like other evaluation associations around the world, AfrEA is not exclusive. Its constituency consists of national associations and networks that include professional evaluators as well as policy makers, academics, government officials, researchers, development practitioners and any other individuals interested in evaluation. Download the early day history from Dr Mahesh Patel here.